A range of good quality ivory envelopes in various sizes. Please note that sizes shown are the actual size of the envelope. WE(C) Codes. 100gsm. 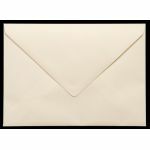 Ivory (Cream) envelopes in a selection of sizes. PLEASE NOTE THAT THE SIZES ARE THE ACTUAL SIZE OF THE ENVELOPE NOT THE CARD SIZE.